the property has a lot of open space. MY ROOM HAD A NICE BALCONY. 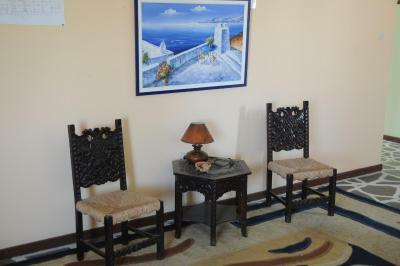 The owner was really helpfull and nice with us, location was easy to find, close to the beach and also to the supermarkets. 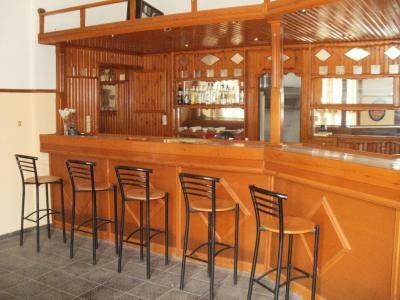 The location was perfect, 50m from the ocean and the Inn of the Beach Bar as well as 100m from the local supermarket and ATM. The walk thru the town was less than 100m with all the bars and restaurants. The hotel was clean and great value for money. The pool was big, clean and inviting. My kids and I loved it. Spyros was very personable and helpful. A great host. This is an idyllic and gorgeous little port and I would highly recommend it. Room was big. A/C worked well. 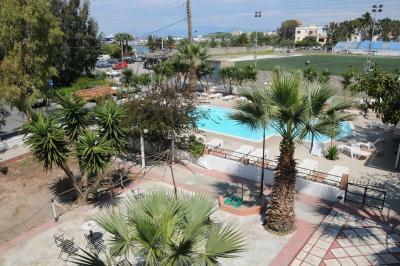 Very close to town center and port. We were in a family vacation with our two children. Initially we have booked a room with 3 beds and requested an extra bed for our youngest one. But we received a big room with 4 beds. 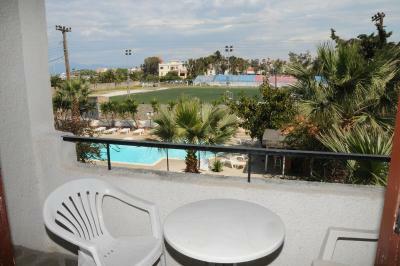 For us was enough space and confort: air cond., tv, small balcony, small kitchen. Also the pool was a joy for our kids. Every day, after breakfast we were leaving for a new direction and coming back at 4 or 5 pm. Near the hotel is a supermarket, so we were having dinner in the room. Then we just were spending the rest of day in the pool. Also we liked the town and the port. We liked to have a walk before bed time. There are enough places to have a good meal and stores. Also there is a good fish market. The nearest good beach is marathonas - 8 euros a taxi in one direction. Another places to visit: Agia Marina beach, Agios Nektarios monastery, Souvala, Moni island. 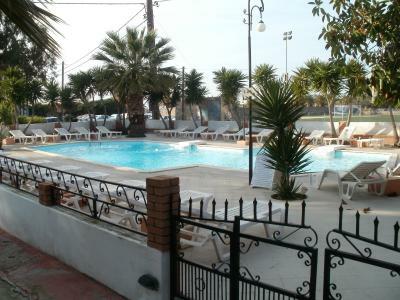 Amazing swimming pool, great garden, peaceful environment, kind hosts. Not too much honestly, but the building is nice, it must have been an elegant old house once. Everything was rather OK. But if somebody wanna see details not everything will be OK. But yes - in that price it is a good place to rest, to stay. 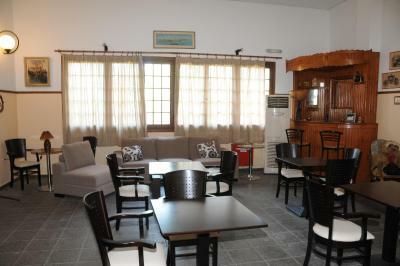 It is the owner reply (the low price, only 2 stars hotel) when somebody here critisize this place and - yes, he has the right. The town is beautiful - very close to the old town, to the market, to the beach. We were in out of season, spending Christmas time there, so it was cosy, silent and peaceful, not crowded. The owner and his wife did what we asked, after the first day the lady who cleaned our room was noce and did her work OK. I had a fantastic few days at Miranta Hotel! 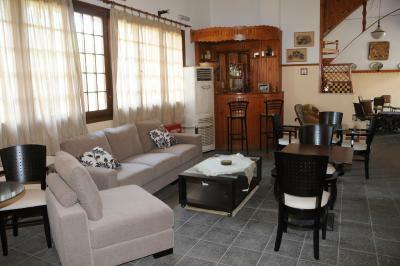 Located two minutes from the town centre, it was a charming and comfortable place. The manager was lovely and not only gave us advice on things to do, but also was always up for a nice chat. Very good value and would recommend to anyone. 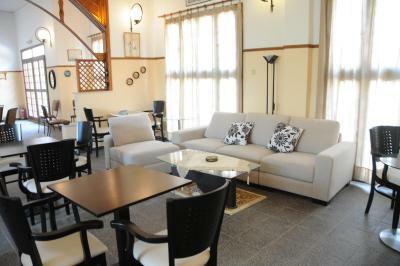 Miranta Hotel This rating is a reflection of how the property compares to the industry standard when it comes to price, facilities and services available. It's based on a self-evaluation by the property. Use this rating to help choose your stay! 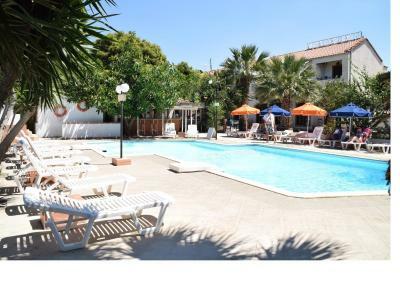 Boasting an outdoor pool, Hotel Miranta is located 200 feet away from Panagitsa Beach. Set amid a large garden, it offers a restaurant and air-conditioned accommodations opening out to a balcony with sea or garden views. Free WiFi is available in all areas. Decorated in earthy tones, all rooms at family-run Miranta Hotel feature warm-colored wooden furnishings and tiled flooring. Each comes with a TV and a fridge. The private bathrooms are fitted with a bath or shower. 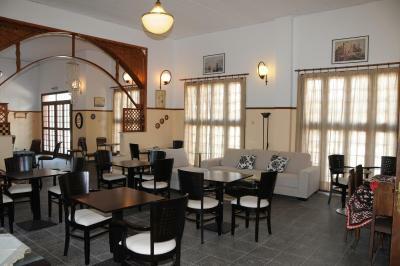 Guests can enjoy traditional Greek cuisine at the on-site restaurant, or have a refreshing drink from the bar. Breakfast can be served in the rooms upon request. A mini market lies within 20 feet from the property. 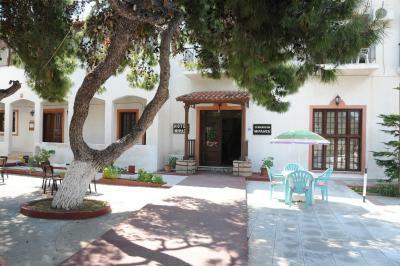 Aegina Port is 1,300 feet away and the island's town can be reached within proximity. Free private parking is available nearby. 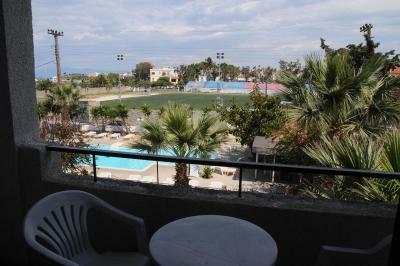 When would you like to stay at Miranta Hotel? Opening out to a balcony with sea or garden views, this air-conditioned room is decorated in earthy tones. It comes with a TV and a fridge. 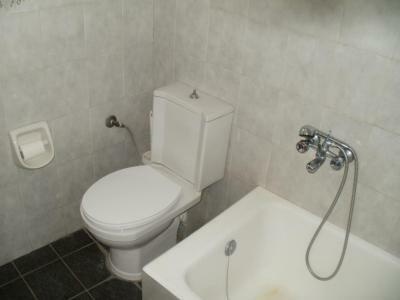 The private bathrooms are fitted with a bath or shower. House Rules Miranta Hotel takes special requests – add in the next step! Miranta Hotel accepts these cards and reserves the right to temporarily hold an amount prior to arrival. I didn't realise that the hotel was on the edge of town rather than in the centre but that was my fault for not checking more closely. The kids loved that there was a pool. 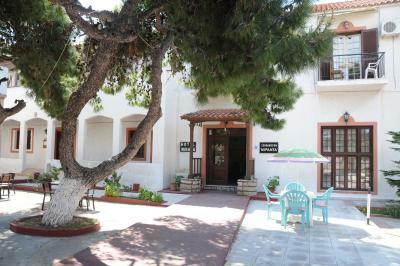 Best value for money in Aegina! Details. The owner for example said that hot water is from 7 to 10 AM and 7 to 10 PM. One day I came to the shower, took off my clothes and it was totally freezy, iced, cold water. I called downstairs, the owner said he was waiting for the fuel or something, he could give me warm water, but I have to wait for 40 minutes. And it was 7.30. Why didn't he said us about that before? He could call us before 7 and apologize. The room was almost clean the first day - the bin was full the rest from ashtray, tobacco, cigarettes. Total disappointment!! The pictures were alll deceiving. The breakfast was a small pack of instant coffee, half done hard boiled hard rolls-just a rip off. Great hotel, really close to the centre, just 1 Min walk. Nice owners. Hotel has a really nice authentic Greek vibe. Definitely would stay again. Comfortable and clean. Good value for money. Great location a short walk from the port. Friendly obliging staff. Breakfast was a bonus. I WAS LOOKING FORWARD TO MY STAY AT MIRANTA. HOWEVER, MY ROOM SMELLED OF SEWAGE! I HAD TO MOVE. THE MANAGER WAS ANGRY THAT I WAS SO SENSITIVE!! HE WAS NOT PLEASANT AT ALL. NEVER USE THIS HOTEL !! MY PASSPORT WAS LOST IN THE RECEPTION !! It cost me lot of money and time to get a new passport and the hotel gave no excuse !! TOTAL CRAB - STAY AWAY. Having read some bad reviews of this hotel, after staying here I am a bit surprised. For a two star hotel, the price/quality relation is very, very good. We spent four days here. They gave us a very nice room with two private balconies, one on each side. When both were opened, lots of light entered the room, although you could also get darkness with the shutters. The room was quiet, had a comfortable new bed,a small fridge, a small water boiler, hair dryer, TV, a roof fan and also air conditioning. WiFi signal reached the room perfectly (the router was next to the door in the corridor, but also there are wifi signal extensors on all the hotel enclosure so the signal is perfect everywhere). 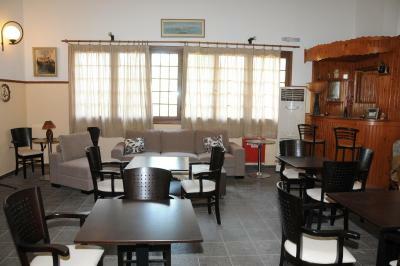 Regarding the hotel itself, it has good location 10 minutes to the port and 5 to the center of the village. It has a large beautiful patio with a small swimming pool. The hotel is managed by a lovely and kind couple (Mr. Dimitris and his wife) who are always available to help with a nice smile. They also have three very nice, friendly, and well-behaved cats (Chaklas and his cat family). Overall, a very pleasant experinece that we would repeat without any doubt.